Milford Sound, in the southwest corner of the South Island of New Zealand is considered by many to be the most beautiful spot in the world. Mountain walls tumble thousands of feet straight down into the crystaline ocean. Dozens of waterfalls thunder down, constantly replenishing the pristine water (underwater visibility is 150 feet). The solid-rock slopes contain no soil, yet they sustain a rich rainforest canopy. Why? Because it rains seven meters every year. This rain feeds the myriad of cascades, and because the fjord below is so calm, the top six feet of water is freshwater, while everything deeper is saltwater. This dichotomy creates a unique underwater environment hosting the only shallow-water black coral on the planet. Rainbows hang in the air, sustained by the misty shrapnel of waterfalls. Cliffs knife into the water, plunging hundreds of feet to reach the ocean floor. Fur seals lounge on the rocks, their dark fur glistening in the brilliant sun. Dolphins frolic in the unspoiled water, playing tag in the boat wake like playful schoolchildren. This is nature at its finest. It is hard to say that any one place is the most beautiful, but Milford Sound sure makes a good case for the title. 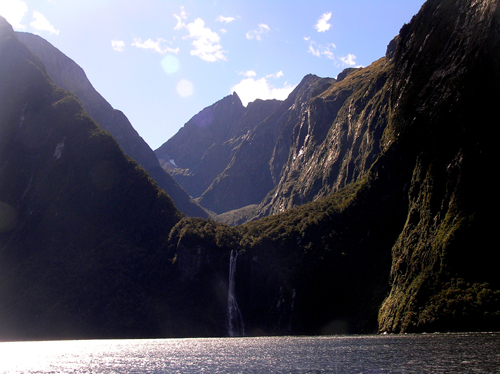 Enjoy the Milford Sound Photo Gallery.